An artist's impression of a NanoLauncher jet on the first leg of its payload's journey toward a suborbital or orbital insertion. The rocket attached to the jet's belly holds the satellite payload and once fired will ferry this cargo for the remainder of its skyward trip. Space is quickly becoming a less remote place as dozens of universities and organizations prepare to launch small satellites in the coming years. For now, however, these mini-satellites must piggyback their way as secondary payloads, meaning operators have little control over the timing of a launch or on reaching a desired orbital altitude for their mission goals. A number of companies aim to eliminate these when and where-to whims – not to mention cutting down on costs -- by offering dedicated small satellite launching services. "Getting reasonable cost access [to space] for small spacecraft is really critical," said Kris Kimel, president of Kentucky Space, a private-public consortium waiting for its first small orbital satellite to be launched in 2011. "We need to get that kind of access that allows us to relentlessly innovate and quite frankly to fail more." The venture will initially operate out of the United States at established spaceports, such as NASA's Kennedy Space Center in Fla., Wallops Flight Facility in Virginia and Vandenberg Air Force Base in Calif.
NanoLauncher plans to use existing technologies rather than create its own rocket or satellite deployment systems, said A.C. Charania, president of SpaceWorks Commercial, based in Washington, D.C. His company is working with three Japanese firms – IHI Aerospace, the Institute for Unmanned Space Experiment Free Flyer, and CSP Japan, Inc. – to get NanoLauncher off the ground. Charania and others in his line of work envision the small satellite marketplace booming in the years to come. "We're riding the nanosatellite wave," Charania said. "It's not an illusion." Small satellites are generally characterized as weighing less than 330 pounds (150 kilograms), though the majority of those built or slated fall under the categories of nanosatellite (under 22 pounds, or 10 kg) or picosatellite (under 2.2 pounds, or 1 kg). The most popular form factor is the CubeSat, a 3.9-inch (10 cm) cube weighing no more than 2.9 pounds (1.33 kg) that has become the industry standard since one first flew in 2003. Building and placing a CubeSat into orbit has historically cost somewhere between $50,000 and $150,000, according to Jordi Puig-Suari, professor of aerospace engineering and CubeSat Project Co-Director at Cal Poly who helped developed the more-or-less international standards for CubeSats a decade ago. These diminutive satellites are very different from conventional satellites used for science and communications, which often weigh hundreds of pounds, are the size of a car, cost millions of dollars to build and launch and take years to go from the drawing board into service. For many applications, traditional satellites will remain the standard. But small satellites are becoming increasingly more capable, driven by the same technology advances that are making personal computers and smartphones increasingly powerful. "Smaller things in the 21st century are capable of doing so much more," Charania said. Small satellites, which can range in shape from a square box to a loaf of bread, have so far been used for research purposes such as Earth observations, remote sensing and biology experiments. Universities worldwide have all gotten in on the small satellite craze, as well as companies such as Boeing, and NASA's third nanosatellite mission is set for later this year. Clyde Space, a major supplier and manufacturer of small satellite components, has conservatively predicted that the number of CubeSats launched will jump from around 50 today to more like 500 by the end of the decade. NanoLauncher intends to be there as this market continues to mature and expand. 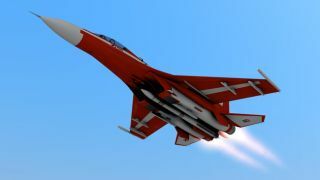 Jets under consideration for the NanoLauncher game plan include the Lockheed F-104 Starfighter and the McDonnell Douglas F-15D Eagle, among others. These fighters will take the payload – slung underneath the fuselage on a rocket – several miles up and then fire the rocket to send the stowed satellites to their intended destination above the Earth. NanoLauncher's suborbital services will be rendered under the brand name NanoLauncher Blue (so named for "blue skies") and orbital insertions will fall under NanoLauncher Black, named for the "black" of space. For the latter service, NanoLauncher has advertised sending a maximum of 44 pounds (20 kg) into a high, circular 155-mile (250-km) orbit, although pricing is still being worked out. Per its existing technology philosophy, NanoLauncher will make use of the standard deployment system developed at Cal Poly and Stanford University known as the poly picosatellite orbital deployer, or P-POD. This spring-loaded instrument can deposit three standard-size CubeSats into space, but is modifiable for various size and shape payloads. NanoLauncher Blue is expected to begin full-scale operations in the 2014 time range and Black sometime in 2015. Other organizations have an eye on the microsatellite market as well. Interorbital Systems, a Mojave, Calif.-based aerospace firm involved in the Google Lunar X Prize and space tourism, will soon begin test flights of its Neptune modular rocket that might send small satellites aloft as soon as March 2011. Interorbital Systems offers CubeSat launches for the very low price of $12,500, sells its own cylindrical "TubeSat" kits (with an included launch) for just $8,000, and on top of this has plans to establish a spaceport on the Pacific island nation of Tonga. The radically different approaches – jet plane-and-rocket combos from existing facilities in NanoLauncher's case to proprietary in-house rockets shooting skyward from a private pad in Interorbital System's – show just how wide open the arena is for the future of small satellite launch services. In recognition of this, NASA is expected to announce details in the coming months for its Nano-Satellite Launch Challenge. This X Prize-style, innovation-promoting contest will award $2 million to the winner who can launch a CubeSat, essentially, into a complete orbit twice in one week. Randa Milliron, CEO and co-founder of Interorbital Services, told SPACE.com that her company will be entering the competition. SpaceWorks Commercial has also expressed interest in signing up NanoLauncher as well. "We hope this will all lead to a lot of space science and a huge amount of fun for everyone," said Milliron. "It's exciting to be the enabler."